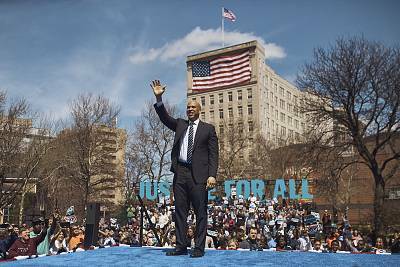 NEWARK, N.J. — Sen. Cory Booker returned to his hometown of Newark Saturday for what he billed as the official launch of his presidential campaign, which he previously announced via video on Feb. 1.Though it's comparatively early in the race, Booker has met with mediocre polling and fundraising numbers while facing a crowded Democratic field.The former two-term mayor of Newark, where he began his political career in the city council, kicked off a two-week national tour centered around "Justice for All." 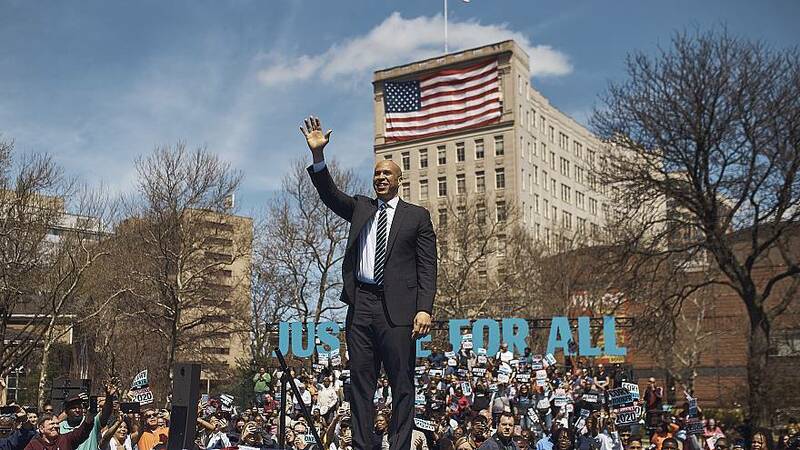 Booker said that his commitment to low-income Americans is evident because he chooses to live near downtown Newark, home to many who fit that description.His speech Saturday focused on Democratic ideals of health care for all, LGBTQ rights, economic equality and a pathway to citizenship for immigrants. But he also challenged the president's divisive rhetoric, vowing to stay above it. "The president wants a race to the gutter and to fight us in the gutter. But to win, we have to fight from higher ground in order to bring this country to higher ground," Booker said to a crowd numbering 4,100 people according to the Booker campaign, which cited an assessment by the chief of security. But Booker, who is a moderate candidate compared to some of the Democratic primary challengers, including Sens. Elizabeth Warren and Bernie Sanders, also challenged the progressive left, dismissing purity tests. "Because the people on my block, the people gathered here and folks all across the country can't wait. They can't afford a politics of division that sacrifices progress for purity," Booker said. "They can't afford to allow this election to become just an exercise in political posturing or a box checking competition that is completely divorced from the realities of so many people who are struggling and hurting. ""And I know and you know that we don't have the privilege to wait for what fits into someone else's narrow view of what it means to be a progressive," Booker said.Meanwhile, Booker left a lot of room for interpretation on an issue that is expected to be a defining one in 2020: health care. He said he supports an incremental approach to Medicare for All, mentioned the words "public option" and embraced the Affordable Care Act — positions that are all-encompassing.The senator was introduced by his mother, Carolyn Booker. Popular Newark mayor Ras Baraka and fellow New Jersey Sen. Bob Melendez also made introductory speeches. Booker's next stop is Iowa.